Cooking Up A Storm specializes in customised culinary events and lessons. We offer hands-on culinary sessions for corporate or social groups for team building, year-end functions, special occasions, etc. One of our most popular services is our on-site culinary lessons for individuals, e.g. domestic workers or yourself – in your own kitchen! Taking part in a culinary activity, i.e. sharing tasks to prepare a meal and sitting down to enjoy the fruit of your labour afterwards, is an effective and memorable way to build and strengthen relationships with friends, colleagues or clients in a fun, informal environment. 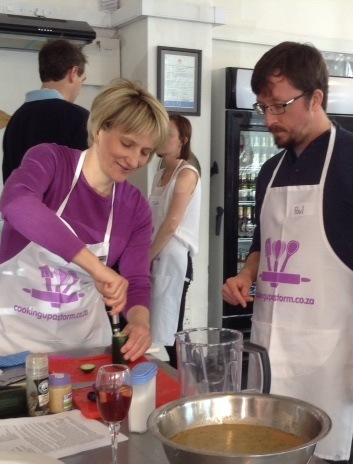 When booking a Cooking Up A Storm culinary session, the event can take place at Cooking Up A Storm Culinary Experiences in Robindale, Randburg or at a venue of your choice, e.g. a restaurant, club house, private house, etc. Choose from our library of cuisines and themes and make your event a memorable experience! The content of my culinary lessons lessons is customised to the students level of skill as well as your family’s lifestyle, i.e. low GI & low fat, low carb and high fat, etc. In a nutshell, I will teach yourself or your domestic worker to cook food that you like to eat, whether it is traditional “boerekos”, modern variations of it or the cuisines of other countries, e.g. French, Italian, Mexican, Moroccan, Spanish – to name a few. Regardless of your current level of skill or the size of your kitchen, learning to cook will change your life. Once you know the basics, you will be able to make just about anything. The possibilities are endless! Please make contact for more information. Also see the Testimonials page for more info. My culinary parties for kids are extremely popular. Read more about it here. Many of my clients are based in Johannesburg or Pretoria, but I have ventured as far as Sasolburg, Hartebeespoortdam and Warmbaths to do culinary events. Just let me know where and I will be there!